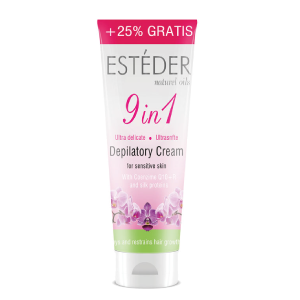 Esteder Depilatory Cream not only gently removes hair close to the root but reveals skin that is visibly bright. Formulated with refreshing fragrances that are inspired by nature. Leave the cream on your skin for 6 minutes, and then use the spatula to gently remove a small test area of cream. but don’t leave it any longer. Rinse your skin thoroughly with water to remove the cream completely.